Atelier YokYok, The Cube at Les Abattoirs, Toulouse. The Cube by French architects from Atelier YokYok is part of the exhibition titled “100 contestations possibles” at Les Abattoirs Musée-FRAC Occitanie in Toulouse. The Cube by French architects from Atelier YokYok is part of the exhibition titled “100 contestations possibles” at Les Abattoirs Musée-FRAC Occitanie in Toulouse. The Cube plays with the anamorphic concept and is an invitation to explore spaces. Anamorphosis is “where pictures or words are created in a deformed perspective and only appear correct from a single observation point (from other positions it appears deformed and incomprehensible)”. We have already showcased some ideas based on this concept on Livegreenblog, including an anamorphic created by Atelier YokYok in Paris. This time, the architects from Atelier YokYok go beyond the two-dimensional decorative work and apply the same principles of deformed perspective depending on the viewpoint to a 3D object - a cube - one of Plato's five solids and the quintessential symmetrical polyhedron. 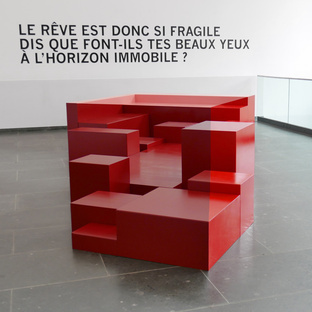 Somewhere between art and architecture, The Cube is designed as a useful, functional work of art that visitors can appropriate both visually and physically. The work by Atelier YokYok consists of a number of geometric volumes scattered around the space, real pieces of furniture. If you observe them from a given viewpoint their lines blur and they look like a single form, a cube. When the human body enters this installation and therefore appropriates it, they combine with the optical illusion of the anamorphosis and the people themselves become the object of a play of perceptions. Positioned at different distances from the observer, the people sitting on the parts of the cube - a riff on the symbolic colour of protest - look like they're actually inside the perspective of the simulated cube. This leads to really surprising optical effects, proof of how unreliable what we see really is. Along the same lines as artists like Georges Rousse and Felice Varini, Atelier YokYok makes its mark in the artistic story of anamorphosis by adding the 3-dimensional volume. The Cube stimulates the invention of new perspectives, made easier through collective use, where participants are invited to occupy the space and everyone finds a place. Installed in Les Abattoirs – Frac Occtianie Toulouse, the modern and contemporary art museum built in 2000 on the site of the city's old slaughterhouses, The Cube is part of the “100 contestations possibles” exhibition, produced in partnership with the CIAM, Centre d’Initiatives Artistiques du Mirail and the Master “Métiers de l’Art, régie, documentation, numérique” as part of the CIAM's 40th anniversary celebrations and the 50th anniversary of the '68 protests. You have until 26 April to visit the exhibition and see The Cube. London Design Festival returns for the 16th year in 2018.